Ultra is the Dutch version of No Wave and series of legendary evenings in 1980, which had bands like Mekanik Kommando and Minny Pops playing. 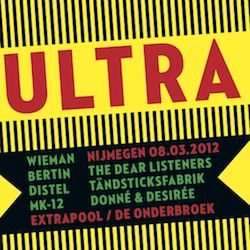 In 2012 a small Ultra revival sweeps the country, and on March 8th Extrapool/De Onderbroek hosted one of the evenings. In these two clubs seven bands played: Wieman (the new name for Zebra with guest vocalist Wally Pops from Minny Pops), Bertin, MK12 (a fusion of Vice and Mekanik Kommando), The Dear Listeners, Tandstickfabriek, Distel and Donne & Desiree. From synth pop to ultra harsh guitar improvisation and free jazz improvisation and sound art - this evening was the perfect showcase of all things that Ultra once was. All live recordings.